K-rats are very docile animals. Many times, they are fairly tame as soon as they are caught and can be easily handled. 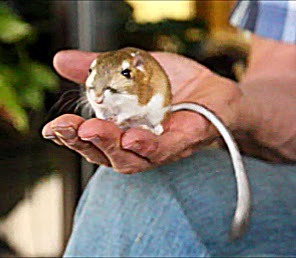 They are the only small mammal which has a tail longer then its body and they use it for balance and leverage when hopping around--like a miniature kangaroo. The video is self-explanatory but emphasizes the incredibly efficient kidneys of these small critters and which allow them to be able to rely mainly on only food for their water needs. Our K-rat was live-trapped from this burrow which was about to be destroyed by field work. I was interested in trapping any K-rats from this burrow with an intention of spraying pressurized insulation from a can into the burrow. The purpose, as can be seen in subsequent pictures, was to make a cast of the burrow system of this K-rat. This is most of the cast as it appeared in the ground. Most of this burrow system was set to be destroyed very soon by field work. Once extracted from the ground, most of this burrow system is illustrated with several entrances and escape routes. Snakes like K-rats so it is a smart idea for the potential prey to have several options for quick get-aways. The grandsons helped release the K-rat into the newly managed area where I hope to establish a population. While this K-rat didn't stay put immediately, we expect it to return and start a home here. Keep us posted on the reintroduction--great to hear about it!